Find the right tour for you through Germany and Poland. We've got 23 tours going to Germany and Poland, starting from just 7 days in length, and the longest tour is 27 days. The most popular month to go is July, which has the most number of tour departures. 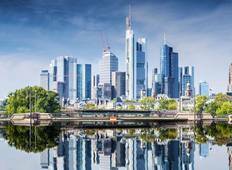 Visit the iconic Berlin Wall, explore quaint neighbourhoods and revel in the city's edgy buzz. Admire fine examples of Baroque splendour in the cultural capital of Germany, Dresden. Enjoy wonderful valley views and shop for the most exquisite porcelain in the fairytale town of Meissen. Leave the city lights behind as you pedal through the glorious countryside and wooded forests while following the meandering Oder River. Discover communist leanings and celebrate the amazing will to survive in the city that personifies Polish heritage, Warsaw. Step into the spiritual atmosphere of the Jasna Gora monastery and view the magnificent portrait of the Black Madonna. 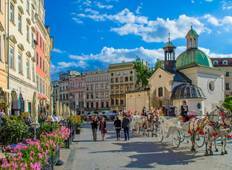 Venture into the fascinating chambers of a salt mine, listen to captivating folklore and wander around the charming Old Town at Krakow. If you like fashionable clothes, head to Berlin’s Kurfurstendamm Boulevard or areas such as Mitte and Friedrichshain where you will find vintage collections. When you want a quick meal in Germany, look for outdoor vendors selling sausages and bratwurst. Avoid putting your elbows on the table while eating at restaurants in Germany. Do not expect to be seated alone as it is quite common to share tables with strangers at smaller restaurants in Germany. Use the phrases ‘Czesc’ for ‘Hi’ or ‘Bye’ and ‘Prosze’ for ‘Please’ in Poland. Use the title ‘Pan’ for men and ‘Pani’ for women while talking to Polish locals. Try different flavours of vodka such as Zubrowka vodka (herb flavored) and Pieprzowka (pepper infused) in Poland. Sample the famous Polish dish ‘Pierogi’ (dumplings filled with meat or vegetables and cheese).